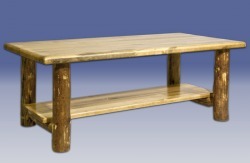 These rustic coffee tables end tables are all available in either Natural Finish (Ready to Varnish)... Laquer... or Glacier Style finish. The Glacier style is the darker contrasting finish you see in some of the photos where more of the inner bark (stratum) is left on the trim and then we varnish it with 3 coats of high quality clear Laquer finish. 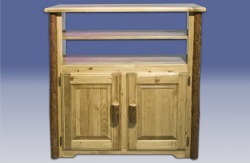 Built with solid pine for the top and shelf and hand-peeled lodgepole pine logs for the legs. Very sturdy and won't warp. 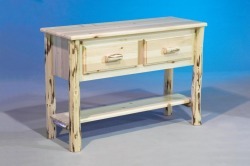 Dimensions on the rustic night stand with one drawer are: 21W 21D 26H. 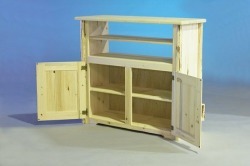 Solid pine with easy sliding drawer. The picture below is what the Glacier style looks like. 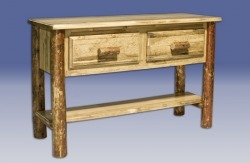 This log table fits behind your couch or in your foyer, also can be used as a sideboard in dining room. 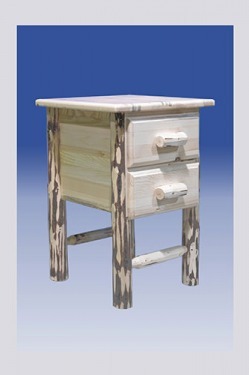 Drawers easily glide open and shut with log handles. 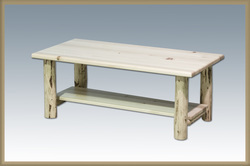 This delightfully practical table serves to hold and keep safe the many items otherwise found in entry or living areas. With two spacious drawers and a full-length shelf in addition to the table’s top surface, you will have display and storage space to spare. 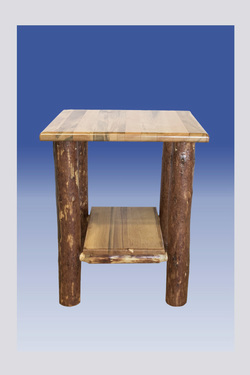 Solid lodge-pole pine legs support the solid pine, edge-glued structure making an extremely sturdy table. 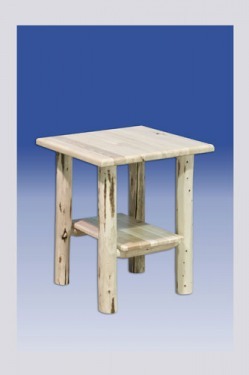 Measures: 48"L x 17"W x 33"H.
The rustic pine end table with a shelf works great in any room... with a log bed or as an end table in your den or living room. Measures 21W 21D 25H. 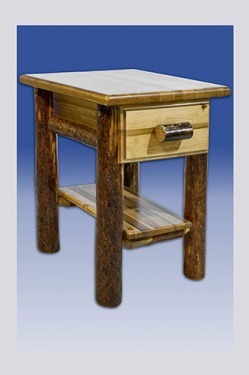 This charming nightstand is just the right height to use with the newer "pillow top" style of thicker mattresses. Designed to securely hold the many electronic devices found in today's modern home, the media center is just the right height to watch television from the comfort of your master bed. Overall dimensions of 44"W x 17"D x 40"H. Two raised panel doors conceal a large, 40"W x 14"D x 20"H storage area with a center mounted shelf to hold CD's, DVD's, gaming controllers, etc.